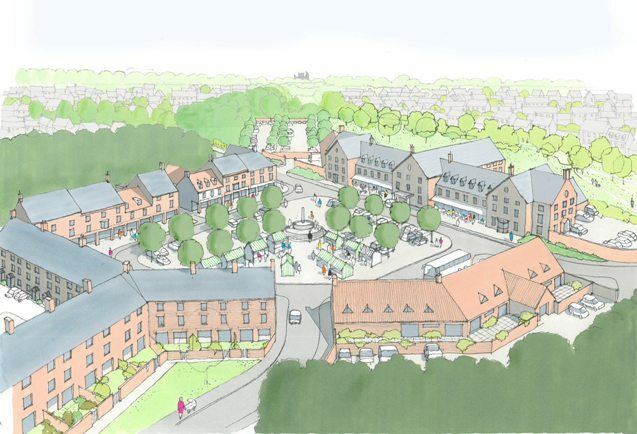 Business leaders, Harrogate Chamber of Commerce members and residents have all backed the plans to build 2,750 high quality homes along with a retirement village, two primary schools, a health centre, sports facilities and a hotel at Flaxby Park. The development company behind the project, Flaxby Park Ltd held an event at Bettys this week to showcase the in-depth and detailed plans for the former golf course. Details of a new 350 car park and ride facility and the re-opening of Goldsborough Railway Station, which will be built and paid for by the developer, were also on display. One hundred per cent 0f attendees surveyed at the showcasing event, half of whom live or work in Harrogate or Knaresborough, strongly supported the proposals for Flaxby Park. Every attendee also strongly agreed that it represented a more appropriate location for a new settlement, compared to the broad location around Hammerton, favoured by Harrogate Borough Council in its Draft Local Plan. Attendees branded the Council’s decision to recommend a new settlement in an undefined area around Hammerton as “ludicrous”. The plan is currently on file with the Secretary of State awaiting the appointment of an independent inspector. A survey carried out by Harrogate Chamber of Commerce has also revealed that more than 85 per cent of its respondents believe that Flaxby Park is the best option. This is also consistent with several other previous consultation findings, including that of Harrogate Borough Council. CEO of Harrogate Chamber, Sandra Doherty, said: “Our town needs to be in a sustained period of growth, not remain static, and a development like Flaxby Park on the right side of the A1 can help this. “We need to be able to offer all of those people who work here the chance to live in realistically priced homes, where they can use public transport to get to and from work in the town centre. “Flaxby Park is the ideal location for the new settlement. Lots of people rely on public transport and people living at Flaxby Park could easily use electric buses or the new park and ride facility and re-opened Goldsborough Station. “We mustn’t forget that a huge number of people living at Flaxby Park could simply walk or cycle to work over the proposed bridge to Flaxby Green Business Park which has the capacity to create 3,000 jobs. The development also offers easy access to the A1 via the existing £4m roundabout without adding to the already over-burdened stretch of the A59. “It’s an absolute no-brainer when you take everything into consideration and our survey shows that the majority of our members obviously feel the same way. We want to get things moving quickly and work could start at Flaxby Park almost immediately. Our members have given all of the Flaxby Park proposals a gold star rating, and they can see how the development would benefit the local economy both in Harrogate, Knaresborough and beyond. “It’s a sensible development, in the right place that also plans to tap into the waste energy from the recently built Allerton Park Waste Recovery site. In our opinion the site really does merit being the only place for a new settlement on this scale. Planning expert Neil Morton, from Savills, said: “We are now all just waiting for a public examination of the Draft Local Plan, which we have been told will happen in the winter of 2018. “The inspector will then carry out a public examination of the Council’s recommendation before making a final decision on whether the Local Plan, and the Hammerton settlement within it, should be given the go-ahead instead of Flaxby Park.